Why have colleges taken up digital marketing over traditional marketing? The answer is quite obvious! Please read to find out more. The most amount of time spent online is by individuals between the age groups of 18 – 25 years and this is the age range of young adult education. 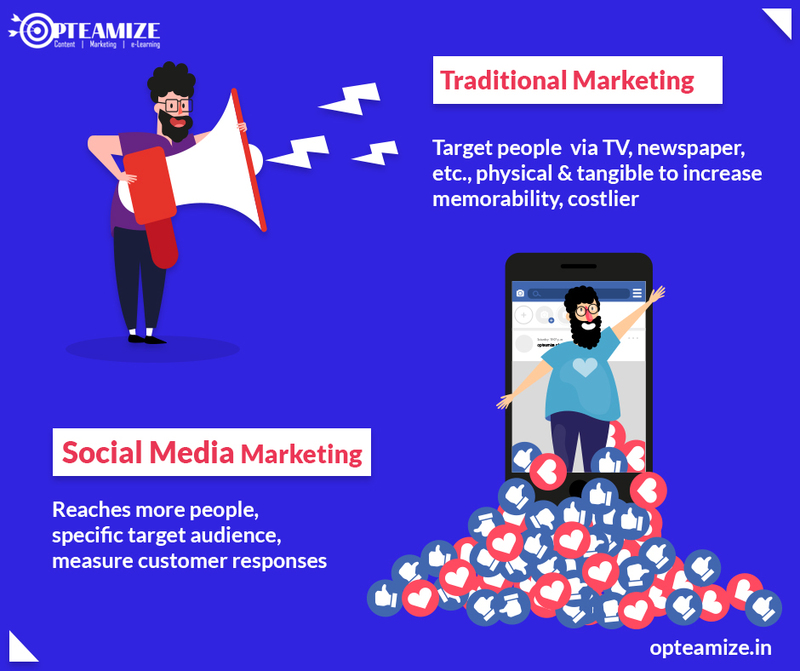 Traditional marketing methods are effective to an extent but comparatively the obvious methods of digital marketing stand out. Digital marketing has been the best way to market an event or an idea amongst college students and reach more people. Why has the world shifted from traditional marketing to digital marketing? An analysis of this will give us a better sense as to the reasons for the boom and gloom of marketing using various strategies. Before we begin, we must clarify that ‘Traditional marketing’ in this sense refers to brochures, flyers, posters, billboards, and other ads not marketed on the internet. Radio and TV ads are electronic ads, but they are expensive. Are you still using age-old methods of marketing and not planning on moving to digital marketing any time soon? Well, there is absolutely no harm in sticking to the basics. Has it ever occurred to you that we live in a cost-effective world where everything works around efficiency of productivity, time, and money? Considering the need of the hour marketing, both digital and traditional play the most important role in the industry. Although the educational system has in the most recent years required marketing only for reasons such as the competing demands and supply in this field, it is quite clear that marketing in the educational industry especially in higher college education marketing wasn’t necessary. Having established that, traditional marketing did play a major role in the early digital years when limited hullabaloo was made in using digital media for marketing. Traditional marketing gained a foothold as it was very effective at the time. It was a big deal for messages to be sent across mediums such as print media, television, and radio announcements, hoarding, and various large-scale advertisements were made use of. One thing stands out here – cost! Traditional marketing is time-consuming, expensive and ineffective. In order to conclude, let’s not condemn traditional marketing completely but simply allow ourselves to be more productive and effective at satisfying the crowd’s needs. The marketing field has changed quite a bit, and it’s time you change along with it. Digital marketing is a hot topic right now and you might be wondering what the fuss is all about. It has been gaining traction and the world has seen a shift to digital marketing. In order to establish a more accurate and concrete statistical informative idea of the matter, the below data has been statistically proven to be true and effective and we couldn’t disagree. We have linked the sources as well. Now that you have read all the above facts, shouldn’t you be reconsidering your marketing choices? Facebook is an extremely popular social media site and one of the 3 Best Places to Market a College Event Online. It is the go-to hangout place for a majority of college students and if you manage to create content that wows them, they’ll come to your event for sure. If you want more, read our post with 5 Tips for Running a Successful Facebook Ad Campaign. Instagram has soared over the past year and many marketers are using it to promote their content. A subsidiary of Facebook, Instagram is arguably the best place to share images and videos, as long as they are high quality. Facebook and Instagram ads are simple yet very effective. It’s time to switch to digital marketing and start posting all about your college event online. There are those that cling to traditional methods, and traditional marketing certainly has merits. The best strategy might be a blend of both. We even wrote about 20 Ways of Marketing to College Students for people who are stuck for ideas. Traditional marketing still has its advantages such as memorability and tangibility. However, most of the methods are considered old and boring, especially among college students. They just throw that flyer in the dustbin. Digital marketing lets you reach more people than traditional marketing and target a certain group of people. Age, gender, location, and interests are just some of the many options you can alter when selecting your target market. Social media marketing lets you reach the group of people most likely to attend your event, giving you the best chances of success. You can also promote it on Twitter as well. If you have a website, running ads on Google through search engine marketing is another option. If you don’t have a website, we can make you one. It’s all about reaching the right crowd, and what better way to do it through the above options to reach the young college-going generation? If you need help with marketing your next college symposium, conference, or sports competition, look no further. Opteamize offers college event marketing services and we can help increase your registrations and sponsors. If you are a college struggling to market yourself online, the struggle is over. Make your college name known everywhere with the help of Opteamize. Contact us now for more.